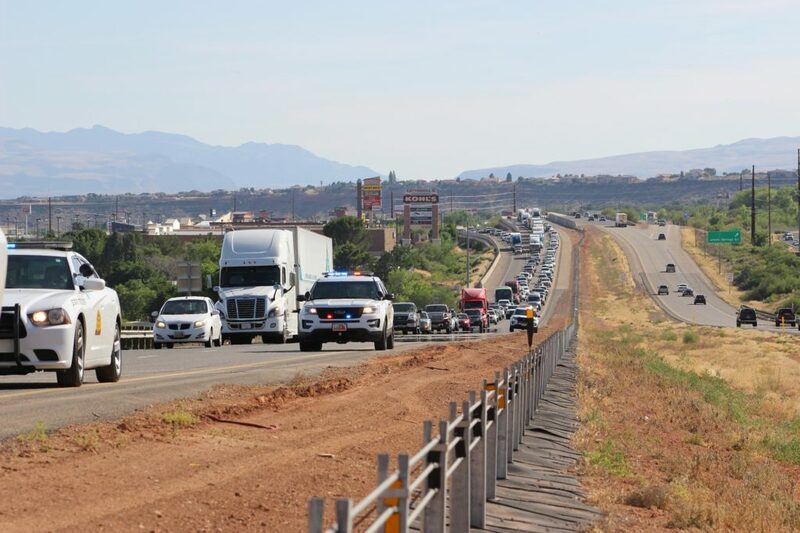 WASHINGTON COUNTY — Two crashes occurring seconds apart on Interstate 15 during heavy traffic Wednesday left two cars heavily damaged and motorists lined up in both northbound lanes as far as the eye could see. Shortly after 5 p.m. officers and emergency personnel were dispatched to a two vehicle crash on I-15 northbound at mile marker 12, Utah Highway Patrol Trooper Grant Hintze said. 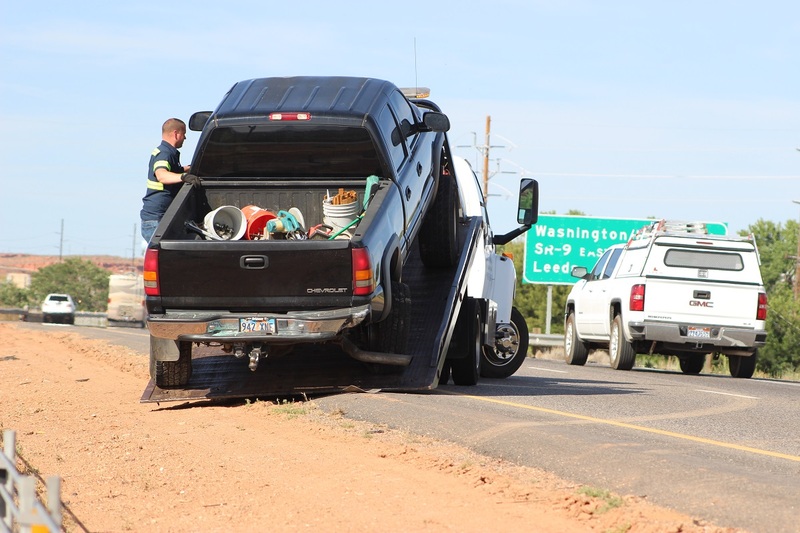 Upon arrival officers found a black Chevy Silverado pickup truck blocking the No. 1 lane and a tan passenger car that was blocking both lanes. Officers also found two vehicles stopped in the median that were involved in a separate crash that was triggered by the first, Hintze said. In the first crash, the driver of a Chevy truck was heading northbound and began slowing near Exit 13 before stopping due to heavy traffic that had come to a halt. A woman driving a tan passenger car traveling directly behind the Chevy failed to see that traffic was stopped in front of her and struck the truck from behind, the trooper said. The rear-end crash left both vehicles blocking the northbound lanes. A northbound silver Ford pickup truck also came up behind the disabled Chevy and swerved into the median to avoid striking the truck before coming to a stop. Seconds later the driver of a silver Nissan traveling directly behind the Ford also swerved into the median and then struck the rear bumper of the Ford that was stopped on the soft shoulder of the median. 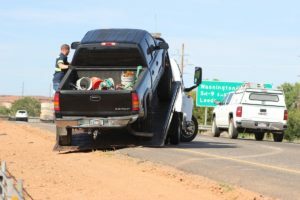 The Chevy and the tan passenger car were extensively damaged and towed from the scene, while the Ford and the Nissan were driven from the interstate. The driver of the tan passenger car was cited for following too close, Hintze said. No injuries were reported. Since traffic by then was backed up for miles, troopers met with the two drivers involved in the secondary crash at the Maverick – Adventure’s First Stop – convenience store off of Exit 13 in order to take the accident report there and open both northbound lanes of travel. All vehicle occupants were wearing their seat belts, Hintze said, and no citations were issued in the second crash. The Utah Highway Patrol, Washington County Sheriff’s Office, Utah Department of Transportation’s Incident Management Team and Washington City Fire Department responded and tended to the scene. This is obviously another distracted driver incident, when are state and federal law makers going to get cell phones usage under control???!!!!!!! The speeds on I 15 need to be adjusted coming through this busy area. 70 MPH is entirely too fast to be traveling past the Green Springs Rd. exit (N or S). On the northbound side at Green Springs, you lose a lane at the same point where traffic is merging onto N I15 and there is a high concrete barrier. Drivers may not be aware of this if they don’t travel this road regularly. Another spot that makes me nervous (and I will tell you I drove in NYC on 3rd Avenue during rush hour in a little old VW beetle and I was not afraid of any cabs and I could make it from 57th Street to 127th Street without stopping) is at the construction by Walmart. There are no STOP signs for merging off the side ramps onto I 15 where they have eliminated lanes on the southbound side.